﻿Our first product, the MGA SAW™, is a fully modernized and re-engineered SAW compatible with existing systems, yet supporting a wide array of modern accessories. Our civilian products, the MGA Mk46™, MGA CA249™, and MGA Mk48™, combine our experience building the best military belt-fed light machine guns in the world with the flexibility of closed-bolt operation using proven Heckler & Koch® trigger groups. The result is a belt-fed, self-loading rifle that looks a lot like the military machine guns, but are legal for citizens to own and enjoy. Our newest product, the MGA SAW K™, redefines the limits of flexibility, light weight, and small size for belt-fed weapons systems. 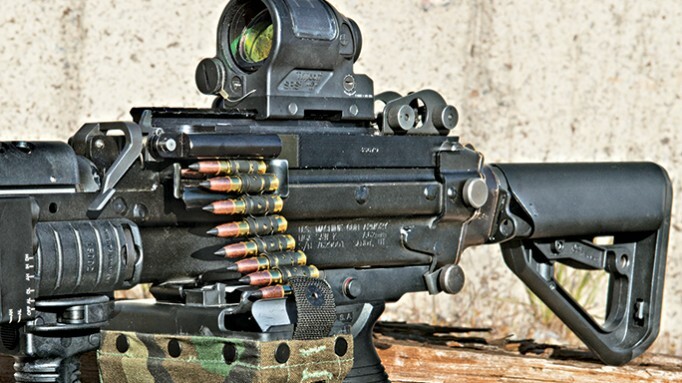 MGA SAW K™ platforms allow individual operators to have the firepower of a belt-fed machine gun in the size of a SMG, and the weight of a battle rifle! The Machine Gun Armory, LLC was founded by former US military, intelligence, and law enforcement personnel, as well as some engineers and scientists. We are a privately owned Utah-based company. As of 2015, our production capability can immediately scale to over 20,000 machine guns per year PLUS spare parts.